Speak With Our Orlando, FL HVAC Experts Now! When you’re looking to upgrade your home’s HVAC system, you want experience on your side. Not only do you want a technician who knows their craft, but you want a system manufacturer who has been at the forefront of the industry for decades. Look no further than Bryan Heating & Cooling Systems, who have been a leader in heating and air conditioning manufacturing for more than 100 years. When Charles Bryant started Bryant Heating & Cooling Systems over 100 years ago, he took pride in one philosophy: dependable, hard-working comfort. Bryant has emphasized quality, durability, and reliability with all of their products, and done so while leading the way in developing new technology for homeowners. Today, all of Bryant’s products are built with the same strict emphasis on quality, including all being 100% run-tested before ever leaving the factory to our dealers. Del-Air Heating & Air Conditioning has proudly carried Bryant heaters and air conditioners for many years, and our NATE-certified and factory-trained technicians are all capable of installing, repairing, and maintaining your Bryant unit. Our experts can analyze your home and help you choose the ideal system for your living situation, and then install it using the latest technology and methods to ensure the job is done properly the first time. When it comes to the upkeep on your system, Del-Air Heating and Air Conditioning can help you as well. Our technicians are highly trained to identify issues before they become major problems, and work to fix them quickly before a breakdown forces you into a serious repair. When you schedule an annual maintenance service, you can trust that our keen eye for detail and through knowledge of your system will have it running optimally again to help you stay cool in summer and warm in winter. Bryant Heating & Cooling’s dedication to building advanced, reliable systems isn’t for their own sake, but because they understand their customers depend on their systems to control the climate in their own home. At Del-Air Heating & Air Conditioning, we take the same approach to each job we take, recognizing that you rely on your system for your own comfort and health. For this reason, we perform all services, whether maintenance, repair, or full system installation, to the highest standards of quality and professionalism, as though were maintaining our own home. 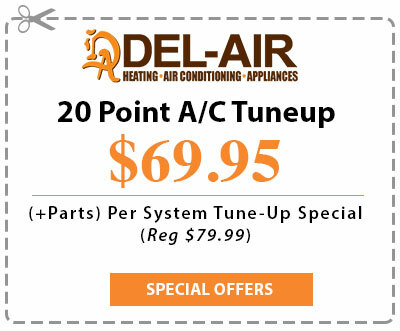 Dial (844) 574-4578 or contact Del-Air Heating and Air Conditioning online to schedule a service or maintenance appointment now!